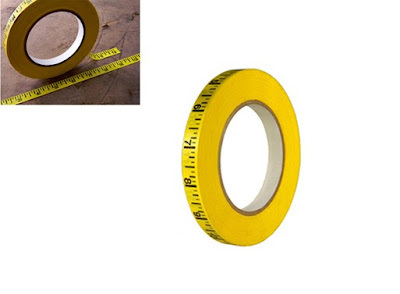 I know this seems like a silly thing to find quite as cool as I do, but measuring tape tape is such a good idea! How many times have you needed to measure a wall or something while alone, and then had to deal with the measuring tape retracting, or getting that weird kink in the metal strip and bouncing back and threatening to take out your eye? Happens to me regularly enough that I think having a roll of measuring tape tape on hand would definitely be useful. Stick it to the wall, unroll gently, measure. I have apparently talked myself into buying a roll. Found via Better Living Through Design.